Legend Billy Liddell was in fact only a "part time" player. He refused to turn into a full time professional and played the game because he enjoyed it. His basic wages was only £20 per week, which was in fact a fair wage at that time (in his words), when you consider that St John's highest basic wage in his career at Liverpool peaked at £40 per week and in 1971 that was comparable to what most workers earned in FORDS. Billy was a model gentleman both on and off the park and this also separates him from some of the players of today. Here is Billy's week at the time he was banging in all his goals at Anfield and other far off places, for a mere £10 a week. Please spend some time reading this, I think it might surprise one or two. After playing a strenuous game on the Saturday, most would think that footballers have a lie in on Sundays, but Billy was up usually around 10.00am. After breakfast, he would make his way to church before 11.00am. After lunch he spent time revising his lesson for the Sunday School he ran at the local Methodist Church in Court Hey. 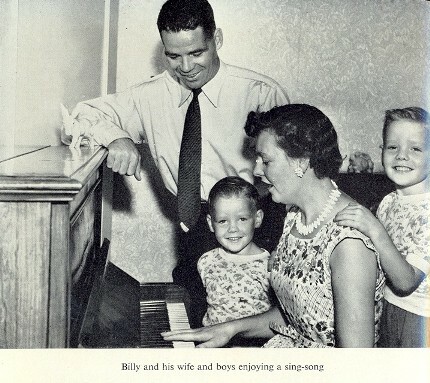 Billy was very fond of children and he loved his time educating the children at Sunday School. When the class was over Billy then had to attend his duties as Sunday School Treasurer. Often arriving home late for Sunday high tea, he would spend the rest of his evening with his family at home. Billy would get up at 8.00am and his first duty was to take his "twins" to school. After dropping the kids off, he made his way to his office in the city. You see Billy worked as an accountant in Liverpool. His lunch time would be spent with friends from a local shipping company. Lunch would invariably be spent discussing both Liverpool and Everton's games from the weekend gone. Billy would finish work at 5.00pm unless there was something that had to be finished that day, and at times like this he worked until finish. A quick tea or sometimes just a bite, would see him leaving home again. You see Billy spent Monday evenings at either a boys club or youth club, where he would talk to the children about his life as a professional footballer. 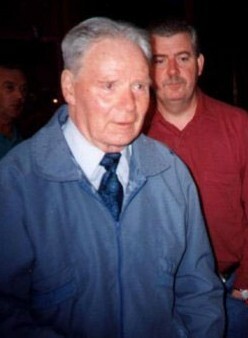 Billy often carried around with him souvenirs he had collected ie medals, caps, jerseys and match programmes to show the interested. Then came the hard bit, Billy always used to spend the rest of the night answering questions, this often went on for a long time as Billy always answered ALL questions. He often reflected later in his life, that some of these questions would stump a football statistician. Another 8.00am start would see Billy once again dropping his children at school. But this time he would be making his way to Melwood. After a hard morning's training session, all the players would have lunch at Anfield, but after lunch when some of the players spent time relaxing or going home, Billy would start making his way to the office in Liverpool. Billy would again work until 5.00pm unless there was some catching up to do, because of the time he had spent at LFC. Tuesdays were only ever varied from above when Billy had to fullfil his duties as a magistrate ie the second and fourth Tuesdays in each month, where he sat in the adult court. The nights were spent with his beloved wife, Billy always took the missus to the theatre, cinema or to a dance on Tuesdays, no matter how tiring the events of the day had been. Billy always described these nights as his SPECIAL time. Billy would get up at 8.00am again, not one for lying in our Billy and his first duty as ever was to take his "twins" to school. After dropping the kids off, he once again made his way to the office down town. For some unknown reason, the pile of post was always larger on a Wednesday. His lunch time today would include a speech at a luncheon club-gathering, which he had revised at break time earlier in the morning. Billy saw these times as opportunities to repay the kindness that the fans shown him. Wednesday nights after tea Billy had to compose his article for the Liverpool Echo (Football edition) and after completion made his way to his very own "IN TRAY". Yes just like the office Billy had an in tray at home for fans correspondence and requests for appearances. The tray was always a foot deep or bigger, but Billy knew, tonight was the night when it had to be cleared to make way for the new lot arriving tomorrow. The alarm goes off, its another 8.00am start again Billy was once again dropping his children at school. Thursdays were similar to Tuesdays, he would be making his way to Melwood again, but training today included a 5-a-side game on the car park and Billy loved these games. 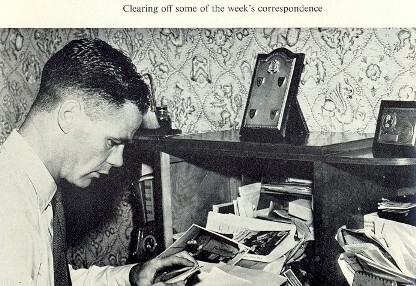 After a hard mornings training session and another hat-trick for Liddell in the car park game of the week, all the players would have lunch at Anfield, but after lunch when some of the players spent time relaxing or going home, Billy would start making his way to the office in Liverpool. Unless of course it was the last Thursday in the month, which was when "OUR BILLY" used to have DJ duties. Yes you read it right ! You see Billy used to have a slot as DJ in the locals children's hospital (Alder Hey) where he played requests for the sick kids. After which he would walk around the wards and talk to children who had requested a visit. As you can imagine, these could be sad times and very happy ones for Billy, but he would not leave the hospital, until all had been seen. Billy would try to be home for 6.00pm but again if there were kids in need, Billy was the man to stay until completion. Thursday evenings were spent at the Liverpool and District St Andrew Society, where Billy was the President. I don't know about you lot but I'm exhausted just writing about his week. Billy's up again, even the larks would be shattered at this rate. It's 8.00am again, and the Twins were running around with a bit more fervour this morning. You see, Friday was "footy" day, some schools called it games, today's the day when the school bag contains not just books, but BOOTS SHIRTS SHORTS and SOCKS and the twins loved their Fridays. Dropping the kids at school, Billy always said to the twins "enjoy yourselves, it's what the game is all about". Heading toward the town on Fridays, Billy often felt apprehensive. Today was the day that Billy sat in the Juvenile Court, which he found interesting at times, but other times were distressing and frustrating. I could tell you a funny story here about my mate, who once stood in front of Billy, but I'm afraid all too often the cases on which Billy sat were very distressing and for this reason, I feel it would be inappropriate. Perhaps another time might be more suited. In Billy's autobiography he wrote... "I don't want to intrude my views on juvenile delinquency here, which is hardly the place, but I feel very strongly that in a large City like Liverpool, there is nothing like the space required for youngsters to let of steam and energy in harmless ways. It is true that many kids go off the rails through lack of parental guidance, but many of those might not do so if better facilities were provided." Billy with great sadness reflected that boys used to be stood in front of him and say, "Hello Billy, I cheer you on every Saturday so don't be too hard on me." And other times he must have grinned inside when he heard stories of some boasting to their mates, that they had got Billy's autograph on their probation forms. Friday afternoons were spent back at the office. Friday evenings were spent quietly at home, unless they had to travel to an away match, that was too far to travel on the day. Billy always set himself a target on Fridays to get at least 8 hours kip cos the strains of tomorrow, required at least that. Billy always indulged himself on Saturday mornings, he would stay in bed until 9.00am. (lazy beggar, I here you say) If Liverpool had a home game, Billy always used to watch his boys play for the local "Life Boys" team. Billy reflected that they are not always the shining lights of their team, but they did enjoy playing. Billy's lunch on the day of the game was always questioned. Some of the team always picked steak, but Billy's ONE poached egg on toast, followed by milk pudding, says a lot about the man in my opinion. You had to report to Anfield on match days at least 45 minutes before kick off, but Billy always arrived at least 15 minutes earlier. You see Billy knew he would get waylaid in the car park by youngsters waiting for his autograph, and Billy never disappointed anyone, he stood and signed every book until there was no fans left waiting. If anyone saw Billy running around the pitch, you would swear that the man must have rested all week, because NO ONE put as much effort into playing, than our Billy. He ran the opposition ragged week in week out. After fulfilling his duties on the pitch and after a cold shower, you could see Billy on the Car Park again and he never left until all requests had been satisfied. On his way home on Saturdays, Billy would start thinking about his "Lesson" for Sunday school the following day and the "Reading" he was due to make in church earlier in the day. Saturdays nights, Billy once again used to take the missus dancing. Often with legs covered in cuts and bruises, BUT HE LOVED DANCING, WITH THE WOMAN HE LOVED. If there is any man / lady here, who thinks that above is not enough for the seven days each week brings, please let me know. If there is any man / lady here who thinks a model professional like Billy does not deserve a statue at Anfield keep it to yourself. How do you end a story about a legend? "It's great to hear so much support for a true gentleman. From my point of view he was not only a football legend, but a caring grandfather. All of your wonderful stories really do paint the picture of the selfless man my grandfather was. We would travel to Liverpool every new year to see my grandparents and billy would always take us out to Aigburth vale or sefton park for a kick around with the ball. When I think back i realise that he always let me and my brother win, and we weren't as good as we thought we were!! Sadly I was far to young to see him play, but have marvelled at his skill and presence on video, and heard many stories from the man himself. I was deeply touched by the number of fans who came to show their love of this great man at his funeral, and thank you all for keeping his legend alive." "It was as so many Liverpool victories have been, Billy Liddell's game. This great footballer steered the team to a two-goal lead from centre forward and when centre half Laurie Hughes was injured in the second half, he moved to left half. He then proved that he was Liverpool's best defender as well as their best forward. He picked off the Everton moves like ripe plums and still had time to make a goal."